From the ashes of the Mexican Revolution (1910-1920), Mexico experience a Cultural Revival behind the brush stokes of Diego Rivera (1886-1957), Jose Clemente Orozco(1883-1949), and David Alfaro Siqueiros (1898-1974). Known as the three "Greats" of the Golden Age of Mexican Art. They used the power of art and images to speak volumes on social, economical, and political issues. Rivera's and Orozco's murals help raised interest to Mexico's indigenous past. They addressed the universal themes of struggle and achievement. While Alfaro Siqueiros murals displayed Mexico's contemporary class struggle. They believed that art must related and inspired people to make changes in their lives. Not only did their theories of art inspired the masses, it also inspired future artists to use the power of art to speak for people that traditionally were oppressed. The influences of the three greats, transcends time and space. During the Chicano movement of the sixties and seventies, Chicano artists looked to the Mexican Muralist of the past for their direction of the future. 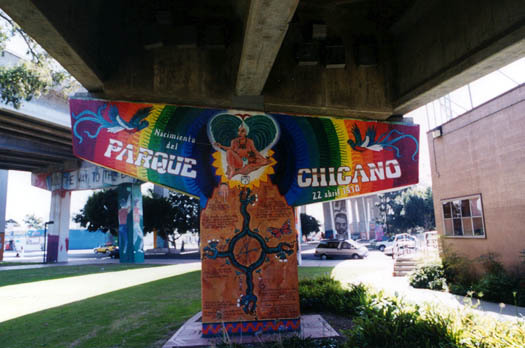 No place is that more evident than in Chicano Park, located in the barrio of Logan Heights in San Diego. What was designated to be a new highway-patrol station in the middle of their neighborhood. The Mexican-American community united and fought city hall and the State of California, and won! Now brilliantly colored murals line the bridges that not only connect the freeway systems, but also connect us to our past. As you walk through the park, the murals take us back to moments in both Mexican and Chicano History. Using indigenous images of great civilizations of Mexico�s part with cultural icons of the last century. The park captures the essence of what it means to be Chicano, and stands as a testament to the community. Who defended their rights, and used the power of art to empower their community.